Home » Breville Infuser Espresso (BES840XL) Review: Should You Buy It? Breville Infuser Espresso (BES840XL) Review: Should You Buy It? The Breville Infuser Espresso (BES840XL) is an automatic espresso machine designed for domestic use. It features an integrated stainless steel water coil and PID temperature control, which ensures a stable temperature during extraction. For optimal flavor, the extraction process also includes a low-pressure pre-infusion stage, which can be manually controlled. The Breville Infuser is a compact unit that comes with a 360-degree swivel action steam wand for heating and frothing milk, and a separate hot water dispenser. The Infuser replaces the Breville Die Cast BES830XL Programmable Espresso Machine and it does represent an improvement. 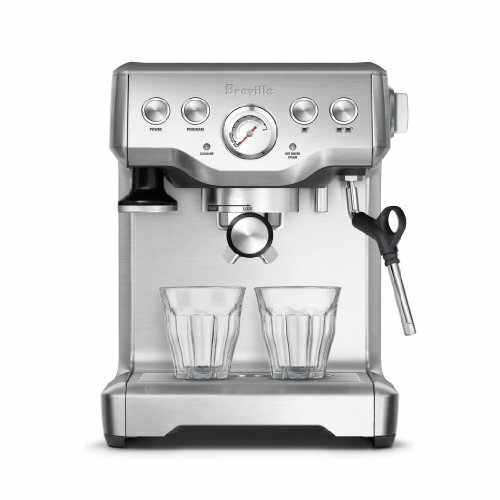 In fact, this is one of the best espresso machines in it price range on the market. Note that the Infuser Espresso is sold new with a coffee scoop, stainless steel pitcher, and a water filter with holder. You also get a cleaning kit comprising a cleaning disc and tablets and a special cleaning tool. As a replacement for the Breville Die Cast BES830XL, the Infuser Espresso has much going for it. Probably the most notable feature is the pre-infusion stage that prepares the coffee grounds for optimal extraction before the 15-bar pressure takes over. In addition, there’s the PID (that’s Proportional-Integral-Derivative!) temperature control technology, which is internally controlled. Do these features make a real difference? Well, the Infuser Espresso is certainly capable of making great espresso, with a lot of experimentation, and these features help the process by offering extra temperature stability. Other eye-catching features of the Breville Infuser Espresso include a larger water tank than you usually get on a machine of this size (61oz). Speaking of size, this is an impressively compact machine, which makes it an especially good choice for anyone with limited space for an espresso machine. Despite its size, the machine does have extra-tall cup clearance so you can brew directly into a travel mug. There is also great attention to detail with the Infuser Espresso, with a quality magnetic tamper that attaches to the side of the machine for easy storage and a heavy-duty stainless steel portafilter. The machine comes with both single and dual walled filter baskets. Newbie baristas can start off with the dual walled. These filter baskets regulate the pressure of the extraction, helping to optimize the process. This means you can pull a fine shot even if you aren’t fully up to speed with the grind, dose, and tamp pressure, or the freshness of the coffee. More experienced baristas can step up to the single walled filter, which allows for more experimentation. In fact, the one thing to know about the Infuser Espresso is that it’s going to take some time to perfect your shots. If you’re serious about learning how to pull great espresso, this is a good machine on which to gain knowledge of the process and how each variable can affect the finished result. One of the key things to remember is to use a fine, but not too fine, grind and to avoid using overly oily beans, as these can clog up the works. Make no mistake, the Breville Infuser can produce great espresso, but be prepared to drink a few bad shots along the way! In terms of operation, the Breville Infuser is pretty user-friendly. Simply fill the tank with water, turn on the machine and select whether you want a single of double shot, using the dedicated front-mounted buttons. Insert the portafilter filled with ground and tamped coffee and the extraction happens automatically. There is a gauge to check the pressure is correct. A loud gurgling sound indicates the boiler is auto filling from the water tank. Remember that before the high-pressure extraction, there is a pre-infusion stage. An optimal extraction should take between 25 and 35 seconds. On the side of the machine, you’ll find the control for hot water and steam (turn one way for hot water and the other for steam). The Breville Infuser has a neat 360-degree swivel steam wand. It does take some time to produce the right consistency of milk foam for your latte / cappuccino etc., but you do benefit from more control over the process. 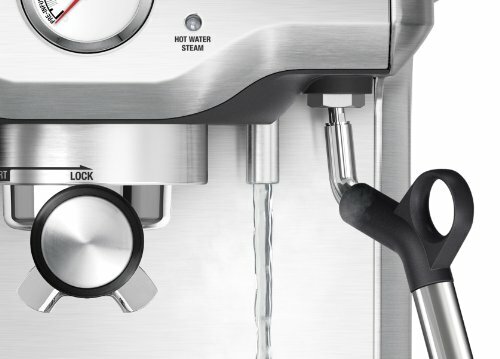 For users that like control over their espresso making, the Breville Infuser lets you change the water volume for each shot and also control the boiler temperature, by 4 degrees up or down in 2-degree increments. After the extraction process, the excess water is removed from the saturated grounds left in the filter basket, this leaves what’s called a ‘dry puck’, which in laymen’s terms simply means it’s easier to empty out the packed grounds for more efficient clean-up. The Breville Infuser Espresso is fitted with a permanent water filter that helps to reduce calcium build-up. It is recommended the filter is replaced every two months, although frequency will depend upon the hardness of the water used. With hard water, it will be necessary to periodically run through the decalcifying procedure, which basically involves putting a mixture of water and vinegar in the water tank and running a brew cycle. When a full cleaning cycle is required, the machine flags up a ‘clean me’ light. This involves back-flushing the unit using the supplied cleaning tablet. Other maintenance duties include cleaning the steam wand after each use, cleaning the portafilter and baskets, and cleaning the external/removable parts of the machine (drip tray and cup warming tray, etc.). The silicone seal surrounding the ‘shower screen’ will also need to be replaced from time-to-time. Maintenance of the Breville Infuser Espresso is not overly onerous, when compared to other espresso machines, but should be done as per the manufacturer’s instructions to ensure the machine keeps running effectively and there are no major issues. The Breville Infuser Espresso is an impressive home espresso machine that has much to offer the experienced and newbie kitchen barista alike. While espresso is all about forcing water through coffee grounds at high pressure, the Breville Infuser Espresso includes a low-pressure pre-extraction stage that helps get the best aroma and favor out of the ground beans. The PID temperature controller is also a welcome feature, which, again, helps the user achieve optimal espresso extraction. It would be nice if this had a manual override to allow the temperature to be altered from the factory preset. But, in truth, this is really just a small gripe. The Breville Infuser Espresso comes with an efficient steam wand that takes its time heating the milk to give you the best consistency for really good latte and cappuccino. There are all kinds of other features that make the Breville Infuser Espresso stand out in its class. These include the handy ‘dry puck’ feature and reprogrammable water volume. Pros: The Breville Infuser Espresso is compact and a well-designed piece of equipment. Its temperature control and pre-infusion features put optimally-extracted espresso within reach of the home barista. The abundance of extra features on offer make this good value for money. Cons: The main negative point to be made about the Infuser is that neither the automatic PID control nor the temperature setting can be manually adjusted. In addition, not all espresso aficionados will like the low-pressure pre-infusion stage. Third party reviews mostly concern individual faulty machines and difficulties in pulling a consistent shot.